When I was first introduced to Sujok, I saw the seeming miracle of my 85 year old aunt’s frozen shoulder recovering with just massage, moxa and seeds on the – no, not shoulder – but the correspondence of the shoulder on the arms and hands. The look of joy at that time was followed by forgetting a few weeks later of what had been done. It wasn’t old age forgetting – it’s what happens when Su Jok, the system of healing devised by Prof Park Jae Woo, touches you. Not only does the pain vanish, but even the memory of the pain. I have seen it happen again to much younger people. That’s as it should be – but after once acknowledging in gratitude what nature is capable of. 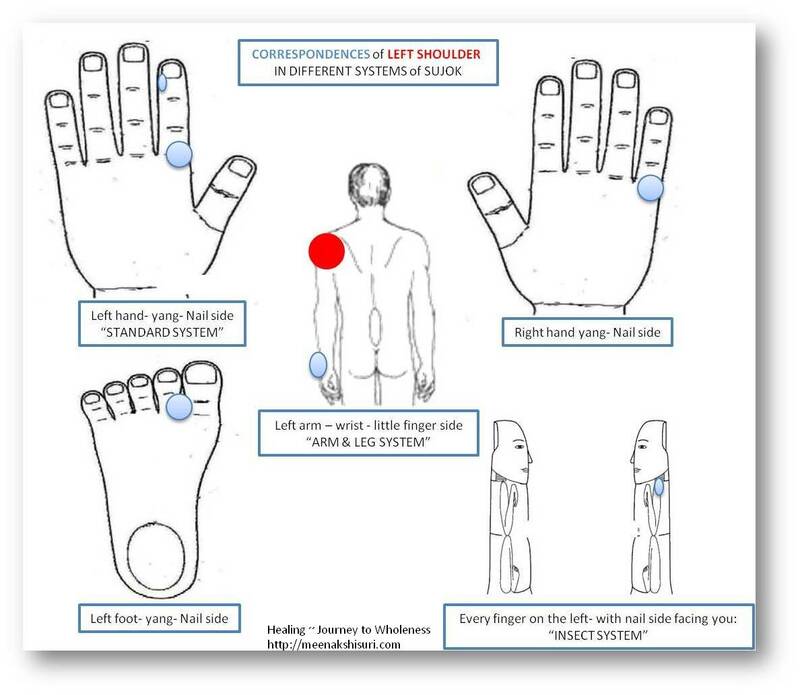 Here are some correspondence points which communicate with the left shoulder and can therefore be used to help heal it. This is just a small taste…there are more ways of reaching that shoulder which are more effective than touching the injured shoulder itself. A Sujok therapist helps a person in pain or imbalance on that path of healing with Sujok, and so can the books written by the Professor – but ultimately, and always, it is one’s own consciousness that heals. Sujok is not ‘just’ for pains and ailments, it helps upgrade your consciousness. I came to realize, through my own experience with an injured back, and seeing people of all ages and ailments getting that indescribable look of joy on their faces, that Sujok is truly a paradigm of healing for the new consciousness that is dawning.. It can help lightworkers walk the earth, and the earthbound to soar, for it knits together timeless healing techniques with emerging ones, and seamlessly connects mind, body, life with soul. Examine the ‘shoulder’. At the level of body it has many layers – muscle, bone, nerves, blood vessels and others, unseen to our eyes but shown to us by technology. Metaphysically, It has 6 meridians giving energy: Small Intestine, Large Intestine, Triple Warmer, Heart, Lung, Pericardium/Brain, unseen but potent. Metaphorically, we shoulder burdens, lend a shoulder to someone in pain, or stand shoulder-to-shoulder with one another. No wonder shoulders can get disjointed, frozen, injured, stretched, strained, at any age. Now you’re feeling that miracle, right? See the organs and glands this flow of energy affects, and you start feeling that the miracle is that such wonders are in our body and we don’t even give thought to it. The body is a temple – not just because some sage or divine being said so – it is your own body showing you when it cries out in pain and then heals with your awareness, acknowledgement and tending. What’s the best way to heal it? In ways that resonate with it – not those that blunder about, trying to find a cure and bludgeoning healthy cells that come in their way. Use seeds. Color. Palm leaf. Micro-magnets.Finger ki.Meditation. Taiji. Twist Therapy.Smile. Nothing invasive or ingested. We haven’t even touched upon chakra energies, emotions, triorigin forces…..
Intrigued? 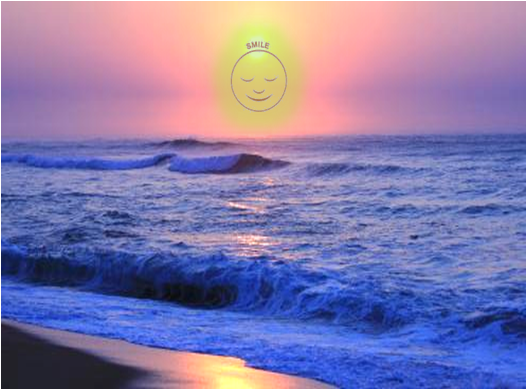 Dip into the ocean of Sujok therapy. Wherever you touch the ocean, you have access to everything that the healing waters contain. Sounds like ages ago, the wise ones knew about the coming of Sujok healing. via A paradigm of healing for this new world on Sujok therapy website. Our school offers presentations, workshops, classes, healing circles in Delhi, Miami, New York, Oregon, Zurich, and other places, for fee or for free, depending on mutual requirements. Are you ready, shoulder? Start moving! Posted on February 14, 2015 February 14, 2015 by Meenakshi ~ Journey In WholenessPosted in Healing Message, SujokTagged awareness, consciousness, correspondence, frozen shoulder, pain, purpose, shoulder, sujok. Thanks for sharing your experience Sangeeta. Hope you’re fully recovered soon. I am a 58 year old woman very active. I run half marathons and also go for treks. I have been suffering from right knee stiffness and pain for many years. I have gone for many physio therapy sessionsand continue to do lot of stretching exercises. Will Sujok Therapy relieve me of stiffness of the knee?